The growing Civita community in Mission Valley has introduced a shuttle service to give residents easy access to the Metropolitan Transit System trolley stations at Fenton Marketplace and Hazard Center. The 20-passenger clean-energy shuttle bus with bike rack and wheelchair lift will initially operate Monday through Friday from 7 a.m. to 9 a.m. and 5 p.m. to 7 p.m. The shuttle stops in Civita are located on Civita Boulevard near Via Alta. The shuttle will operate in a continuous loop. Residents will be able to determine the next pick-up time via a GPS tracking system available through CivitaShuttle.com. 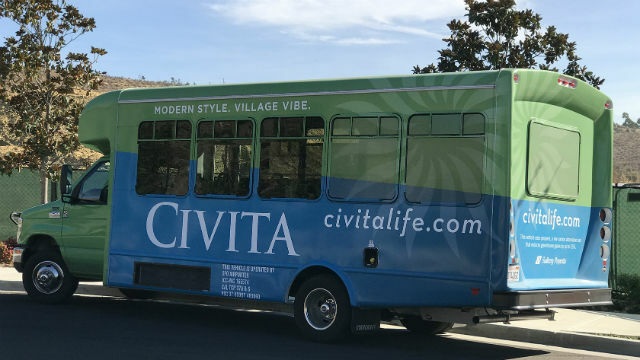 “This free shuttle service, operated by the Civita Homeowners’ Association, is intended to help Civita residents with their commutes,” said Mark Radelow, vice president and senior project manager for Sudberry Properties, developer of Civita. The shuttle bus is fueled by propane, a clean-burning fuel also used by MTS buses. Civita is being developed on the site of an old sand and gravel quarry. The 230-acre urban village will ultimately have 4,780 homes and apartments, 480,000 square feet for a retail center and 420,000 square feet for offices.